Do you need a little Sweet Easter Treat to brighten your spring-time?!?! 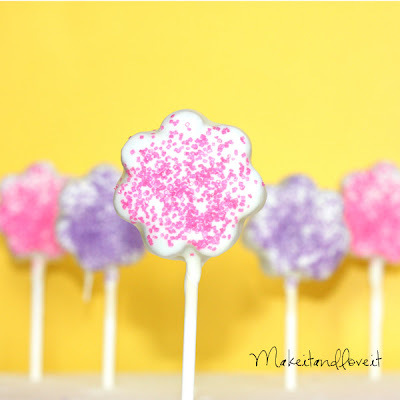 Remember when I used Bakerella’s recipe to make little cake pops here? So I made these with carrot cake, instead of chocolate. And some of them I filled with cream cheese frosting. ***Little side note: I couldn’t get the filled cake pops to stay on a stick. Because the centers were so soft (from the frosting) they, didn’t stay on the stick firmly enough while dipping in the white chocolate. And if you go and visit Bakerella right now, she has some of her own little Easter cake pops, that are just darling/adorable/perfect!!!! I just made something similar for a baby shower, except I used marshmallows. I think the carrot cake with cream cheese sound soooo much better. Just found your blog and am in love!! Thanks for all the creative ideas – and your etsy shop is adorable! Keep up the good work! How did you fill the carrot cake with the frosting? Those look amazing! Wonderful job! Serious? Well- bless the snow. It’ll help the ground, right? I’m going to freeze when we get back. Jodi, I guess I should have explained that better. But I just formed half balls, put a chunk of frozen frosting and then put another half of the ball on top……rolled it around in my hand to get a smooth ball and put it back into the fridge again to chill before dipping. Make sense?? Summer, are you chilling the cake dough before dipping? Like Bakerella, I stick my formed balls into the freezer for like 15 minutes, dip them into the chocolate and then I stick them into the fridge before eating. I kind of like the taste of them chilled but my husband likes them more room temperature. So it just depends. Oh yum! You HAD to post these on the day I started my diet! I should have put it off until April 1st like planned, then I could have made some and scarfed them all down today and tomorrow! These just might have to be my reward if I do well this month! Snowing when its “spring” just doesn’t seem fair, we got it here too. Ashley… i love your cute blog and all the fun ideas… i was just wondering where you purchased your sucker sticks and sucker wrappers? 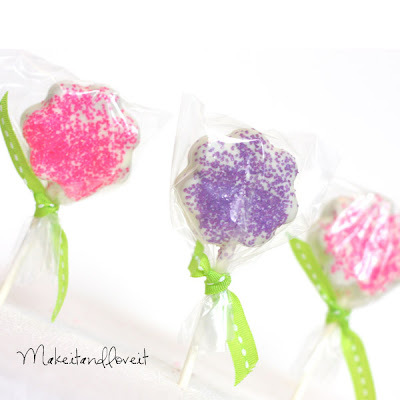 i want to make some cupcake pops for my daughter’s 1st bday and wanted some on sticks wrapped in plastic (like you have done) for the party favors. Chicy…….Hahaha, so sorry. I should be doing the same thing. Hmmmm……maybe tomorrow. Amber, so glad you’re trying out the pops. I found the sticks and wrappers at wal-mart in the cake decorating section over by the crafts. They have them right there with all the cake stuff and wedding favors and all of that. I’m assuming that will be so for every wal-mart. Good luck with your little girl’s party!! I used the white chocolate bark from the grocery store. You can also buy those little chocolate melting discs of chocolate……usually over by the cake decorating stuff in the stores.